During the workshop we are going to test different materials and construction systems that we are going to use during the Summer School. In this experiment we tried to create a surface which can stand vertically and carry its own weight. Scaling up with the same hoses (polyethylene tube (gapex) 10/12 mm) created problems with the stiffness of the surface. We also experience bucking problems in the peak points (midpoints of the hose). We made several experiments and created a small surface with polyethylene tubes. Each element consists of two hoses weaved to each other. The second system we are going to introduce is a bioreactor system for algae to grow inside he pipes. We need a pump for the continuous water flow. 3- it is better to have a bigger attachment area where we want them to grow. 4- a continuous hose with less joints is better. We started making diagrams of the possible movements, different patters etc. In line with the preparatory events for Summer School, Nilüfer Kozikoğlu, Burcu Biçer, Gamze Gunduz and Menelaos Kokkinos visited Delft. 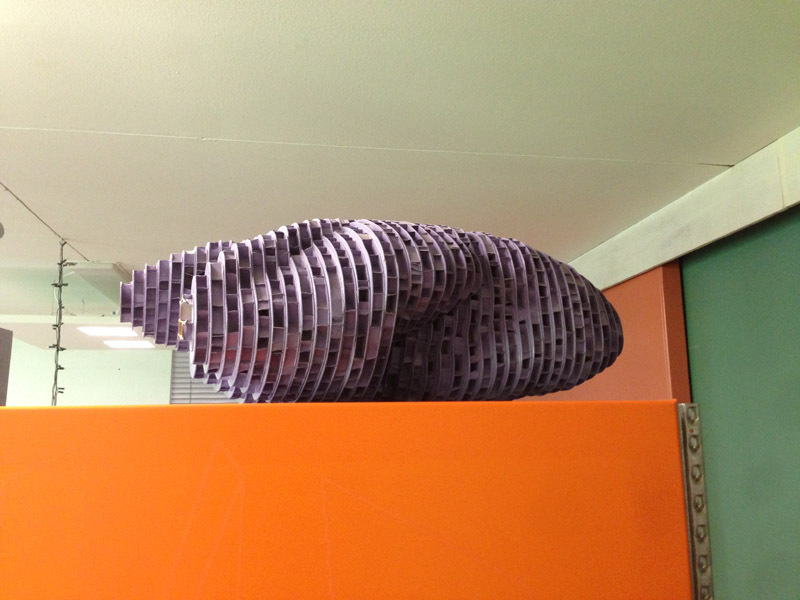 They visited Prof. Oosterhuis office in Rotterdam. J. Jaskiewicz and his team organised a tutoring session with Hyperbody students and an introduction on how to work hands-on with HiveKit. Tutorials Session are scheduled before the start of IGSS for student to get acquainted with the designing tools in preparation to Summer School. 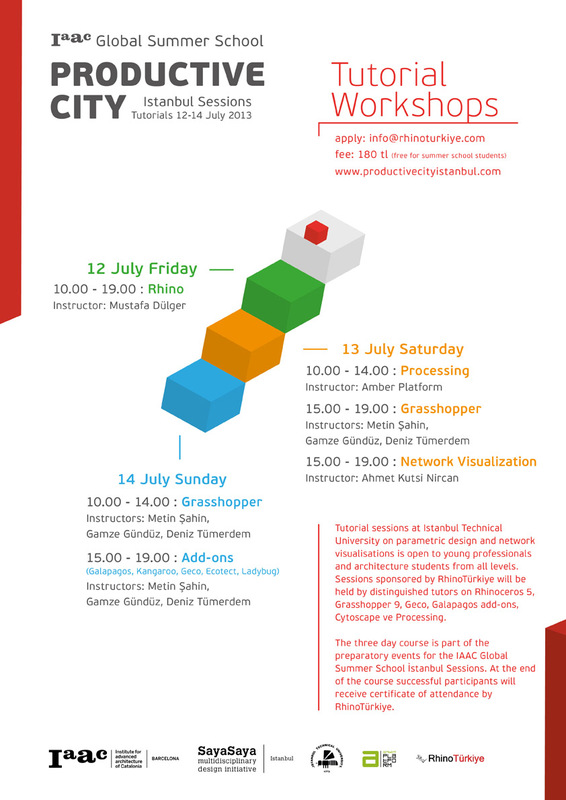 The first day Mustafa Dülger will give tutorials on Rhino 3D and a brief introduction in Grasshopper. Second day will continue with lectures about Network Visualization by Kutsi Nircan and Processing Tutorials by Ekmel Ertan (Amber Platform). Metin Sahin in parallel session will make tutorials on Grasshopper. During the third and last day Gamze Gunduz and Deniz Tumerdem will give lectures about Galapagos, Kangaroo and Geco. Those who are interested to attend ONLY in the tutorial sessions can send a mail to info@rhinoturkey.com. 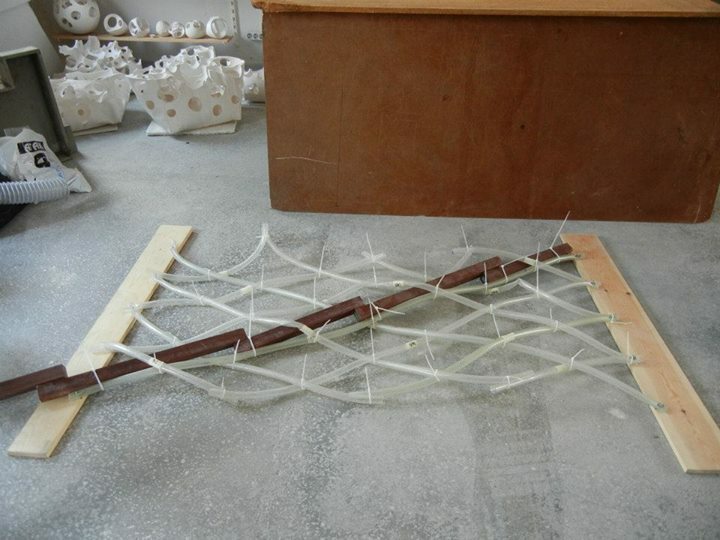 The students will elaborate in the conceptual idea and the deisgn. Students will be provided with the mapping and information on existing environmental factors and information on movement flow and space syntax analysis on five sites. They will have to use this data and design according to the potential and needs of each site. The first day the team will visit the site and play the 2 to 1 game . The Lecture Sessions will start with “Materials and Experimenting Systems” Lecture and continue with lectures about “Network Analysis Seminar”, “Ponics Systems”, “Processing Tutorials” and “Space syntax”. During the first period there are three days scheduled of Processing Tutorial. The first Phase will end with a pin-up day on the 20th of July. During the second phase students will focus on production details and techniques. 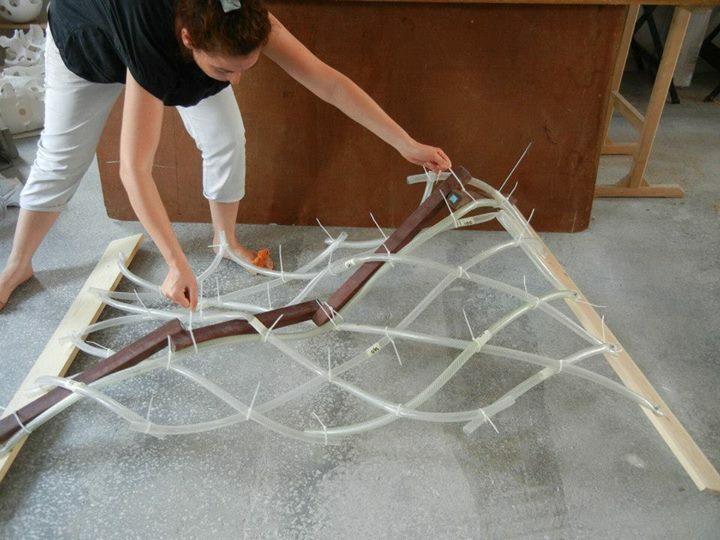 The desired outcome is scale prototypes and a 1/1 prototype of the designed interface. 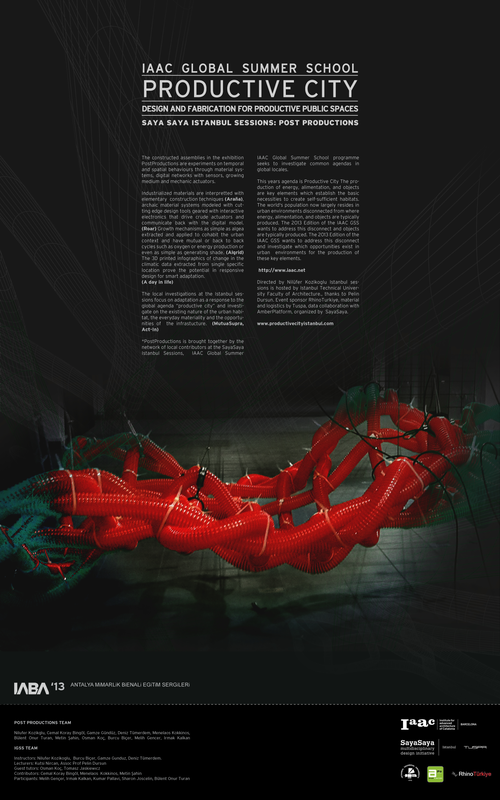 The Lecture Sessions will continue with Digital Fabrication Sessions and T. Jaskiewicz will talk about the Hive systems. Advanced digital design methods and fabrication processes will be used in an integrated way to make physical things from virtual data. This session will focus on transition between computer modeling and materialization. 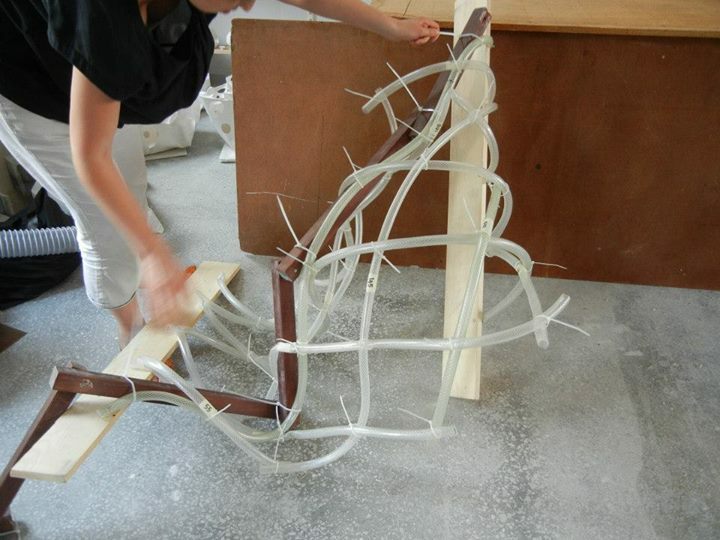 The responsive surfaces designed in the previous sessions will we fabricated. In the end of the period students will have their final presentation in front of a selected jury. 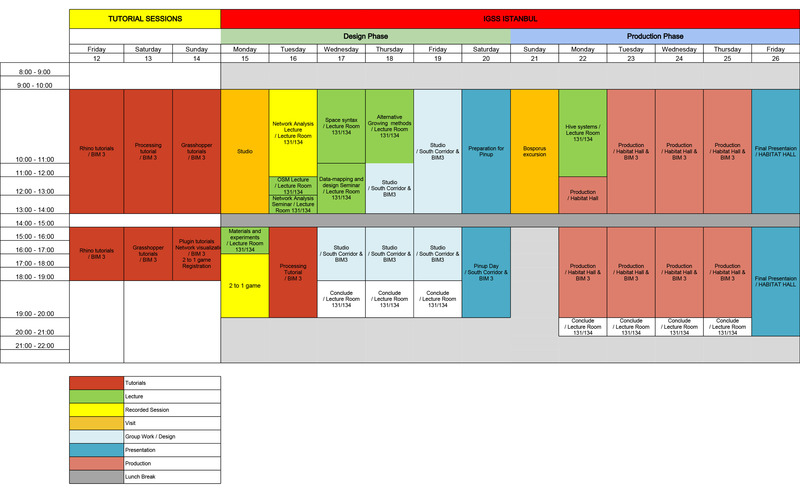 The tutorial sessions will be held three days before IGSS (12-14 July). Those who are interested to participate only in the tutorial session the fee is 180TL. Tutorial session will introduce to the students with the designing tools in preparation to Summer School.The first day Mustafa Dülger will give tutorials on Rhino 3D and a brief introduction in Grasshopper. Second day will continue with lectures about Network Visualization by Kutsi Nircan and Processing Tutorials by Ekmel Ertan (Amber Platform). Metin Sahin in parallel session will make tutorials on Grasshopper. During the third and last day Gamze Gunduz and Deniz Tumerdem will give lectures about Galapagos, Kangaroo and Geco. 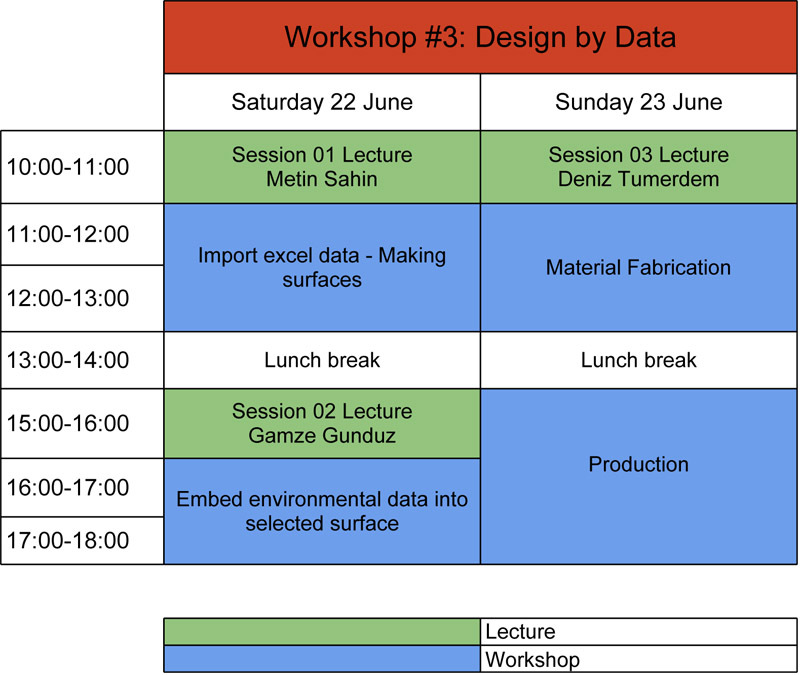 During the workshop Gamze Gunduz, Deniz Tumerdem and Metin Sahin will introduce the main principles around design by data. In the first session Metin Sahin will run a tutorial on how to install and edit excel data and how to make surfaces. Second session is about embedding environmental data onto selected surface. Analyses in Ecotect with weather file and then the information will be imported in Grasshopper through Geco. With the use of Galapagos, it will be possible to work on a responsive surface that will react to real time data changes. Finally, several optimized surfaces will be produced for different times of the year. The purpose of the session is to further understand the relation between data and geometry and the notion of a responsive surface. Third session is about Digital Fabrication, ie. the advanced digital design methods and fabrication processes in an integrated way to make physical things from virtual data. This session will focus on transition between computer modeling and materialization. 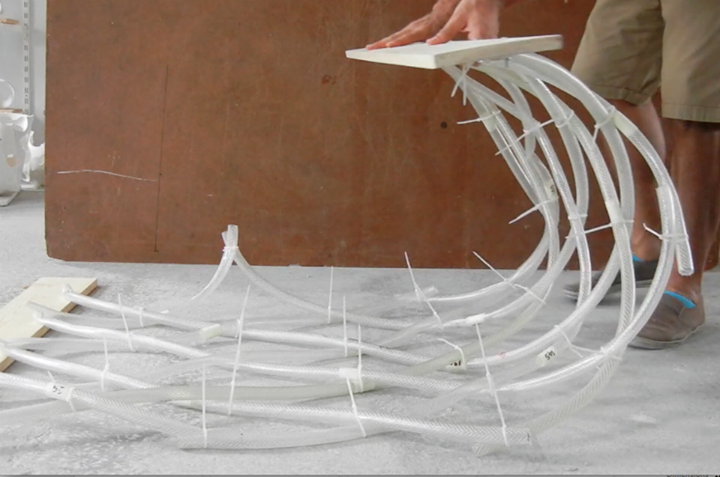 The responsive surfaces designed in the previous sessions will we fabricated. The goal is to translate the language of design into one of the digital fabrication methods: CNC Laser Cut, CNC Milling and 3D Printing. A family of surfaces will be fabricated while understanding the different processes; CAD (Computer-Aided Design) geometry , CAM (Computer-Aided Manufacturing), Material Preparation and Machining Process. The workshop will take place on 22-23 of July in Taşkışla. If you want to join us sent a mail at infosayasaya@gmail.com. Note: Replicator2 Makerbot is now at ITU. In this section you will find interviews from the instructors during the Summer School in Istanbul. New videos will be added soon. 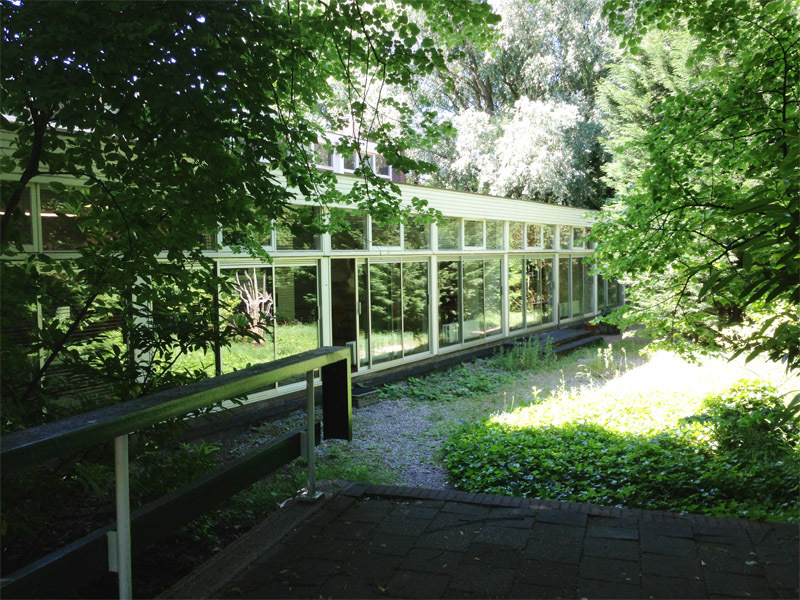 The registration deadline for IaaC Summer School has been extended. The new deadline is June 12th, 2013. The Information mapping of ITU Ayazaga is done!!! Please see the link below. 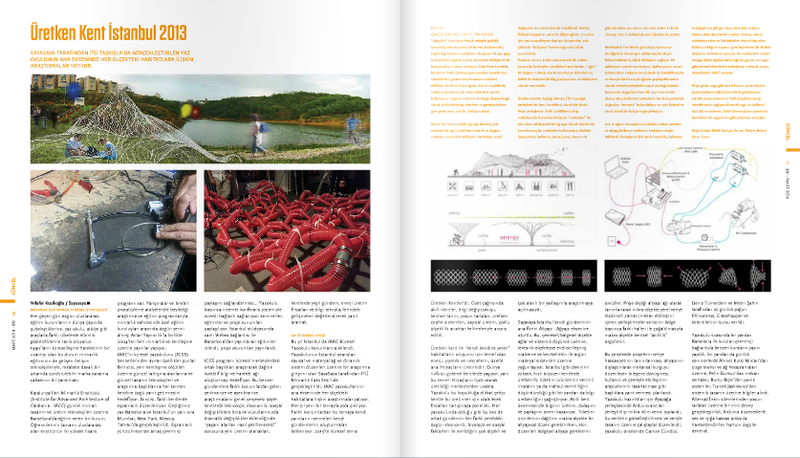 ITU Macka Campus analysis are soon to be published !! !